Portugal make their Euro 2016 debut against 'newcomer' Iceland in Group F at Stade Geoffroy-Guichard. Who will get all the three points? 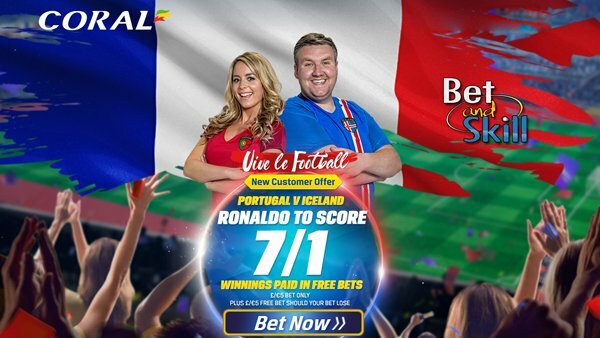 You can't miss our Portugal v Iceland betting preview with predictions, betting tips, enhanced odds, starting line-ups, no deposit free bets and exclusive offers on the European Championship. Portugal topped a group of five nations with seven wins and one defeat to finish seven points clear of Albania with Denmark third and Serbia fourth. Despite a shock defeat to Albania in the opening match of qualifying, they recovered by winning their next seven to seal top spot in Group I. Anyway, they actually struggled as Cristiano Ronaldo & co. scored just eleven goals in the process and four of their seven wins in qualification were by a 1-0 scoreline. Friendly international results this year include a 2-1 home win over Belgium, 3-0 over Norway and 7-0 over Estonia but they suffered a 1-0 defeat at the hands of England at Wembley. There is an abundance of options in midfield, with Joao Mario, Andre Gomes, William Carvalho, Renato Sanches and Adrien Silva all vying for a place. Quaresma was given a rare start in the final warm-up match against Estonia on Wednesday and responded with a virtuoso performance and he is in contention with Nani for a starting berth. This is the first time that Iceland are competing in a major tournament and are serious underdogs coming into the fixture. They qualified for the Euros by finishing runners up to Czech Republic with a record of 6 wins, 2 draws and 2 defeats. As to the warm-up games, the Scandinavians were beaten 3-2 away to USA in January and lost 2-1 in Denmark in March. Then they posted a 3-2 win in Greece before to lose again 3-2 in Norway and hammering Lichtenstein 4-0. Kolbeinn Sigthorsson and Alfred Finnbogason are likely to start up front while veteran striker Eidur Gudjohnsen will be benched. Jon Dadi Bodvarsson is another attacking option. Gylfi Sigurdsson and Aron Gunnarsson fit despite carrying injuries when the squad was announced. Arnor Traustason may get the nod on the left flank, with Johan Berg Gudmundsson on the right. Portugal (4-3-3): Patricio; Vieirinha, Alves, Pepe, Eliseu; Moutinho, Pereira, A. Silva; Nani, Eder, Ronaldo. Iceland (4-4-2): Haldorsson; Saevarsson, R. Sigurdsson, Arnason, Skulason; Gunnarsson, Gudmundsson, Traustason, G. Sigurdsson; Sigthorsson, Finnbogason. "Portugal v Iceland predictions, betting tips, lineups and free bets (Euro 2016 - Group F - 14.6.2016)"